Can Heaven be in a room? 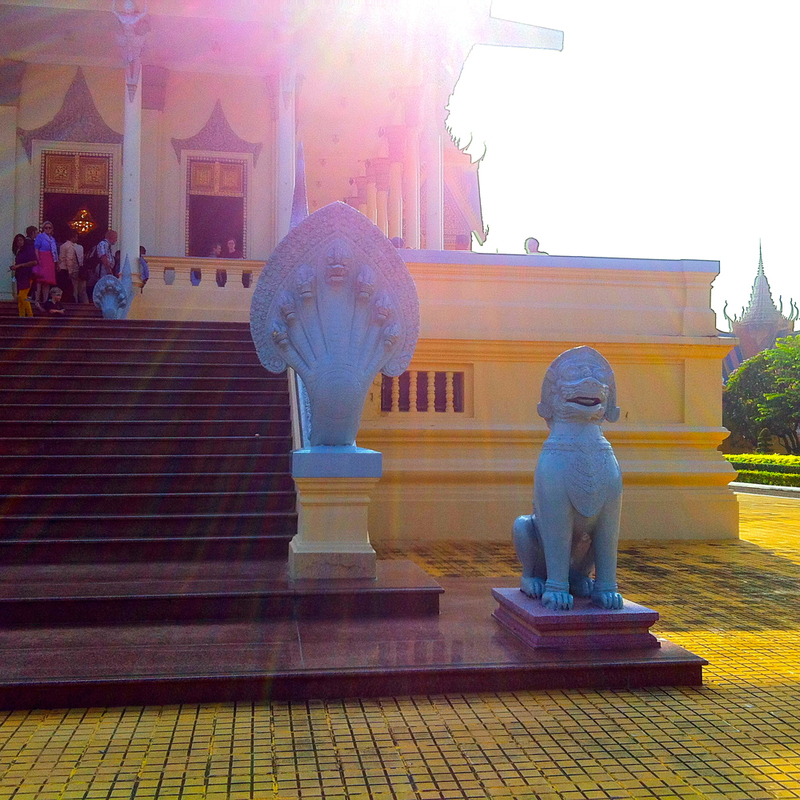 I haven’t found the answer in my spiritual books, but based on my experience at Phnom Penh’s Royal Palace, I say yes. After traveling to Europe three times, I’ve seen my share of ornate palaces. 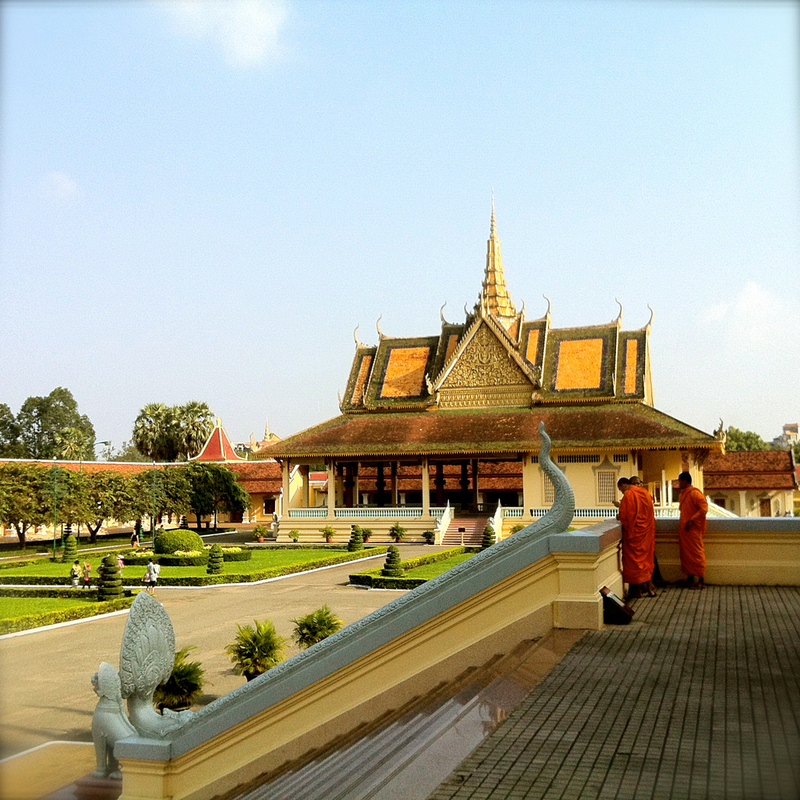 But no palace I saw in Europe feels like the Royal Palace in Phnom Penh. 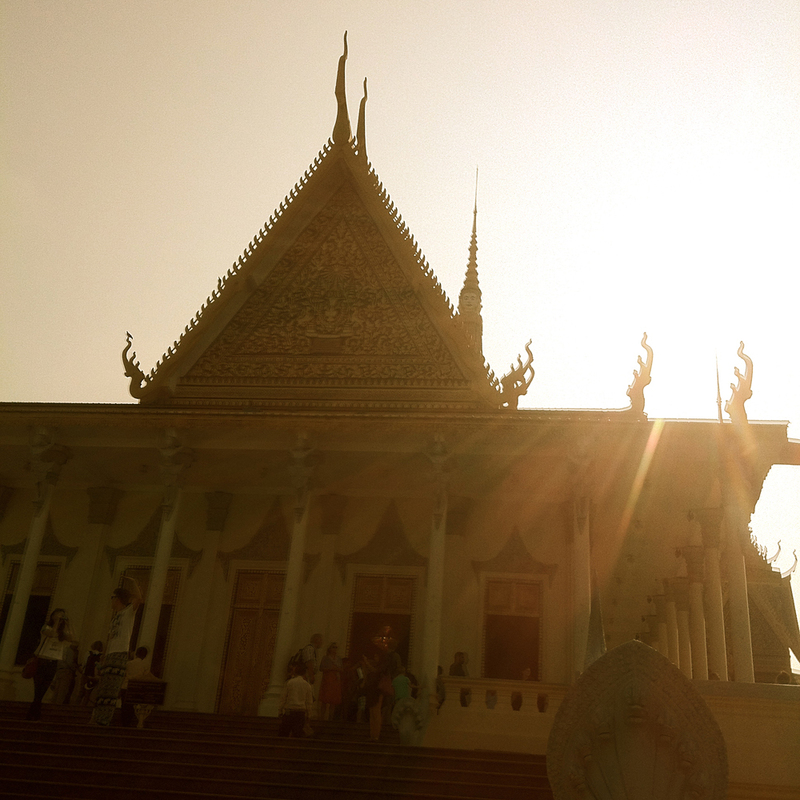 I didn’t go to the palace with any expectations other than an escape from the dust and traffic outside. 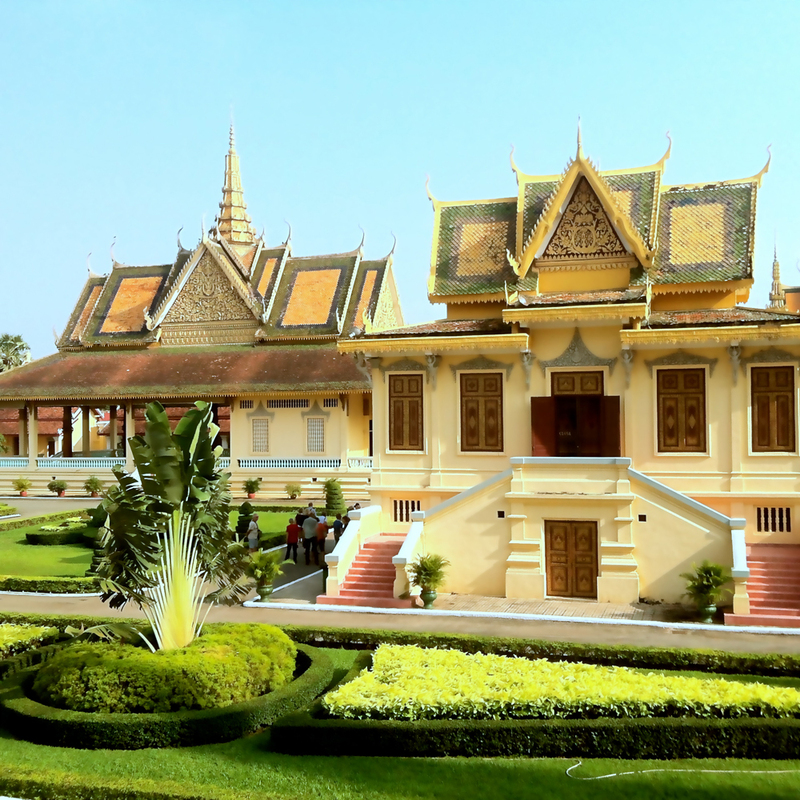 Maybe it was my relaxed state, or my budding love for this country, or the bright sun and even brighter colors of the buildings… whatever it was, I adored the palace. 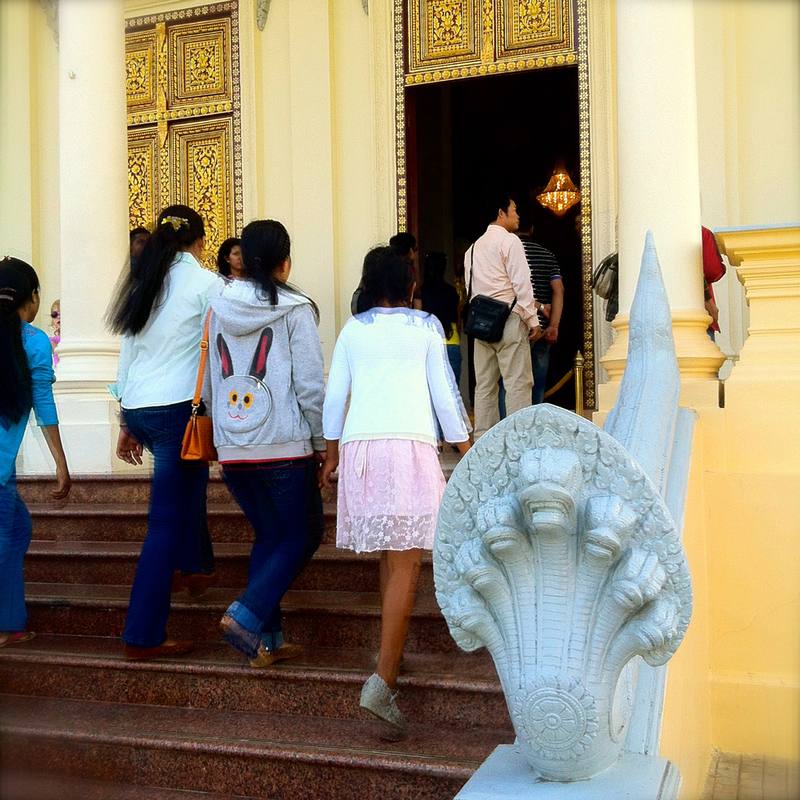 The Heaven Room – as I’ve now christened it – but more commonly known as the Throne Hall, is the first building you see. We weren’t allowed to take pictures inside, but we could float around and peer into the windows. I was most struck by the utter calm of the room. Rather than cold marble (which perhaps I’m used to seeing in Important Places), the room is softened with beautifully patterned tile and matching custom carpet. The decor is ornate, in palace fashion, with crystal chandeliers and golden details. The air inside is cool (thanks to rare AC) and the walls are a light blue-silver. Large mirrors are placed by every other window to ward off evil spirits. Combined with the Naga at the entrance, also on evil-spirit guard, there isn’t a single drop of negative energy anywhere in the room. The length of the Naga with three monks. While we weren’t allowed to photograph the day we went, blogger DesignClaud captured some beautiful pictures of the Throne Hall here. 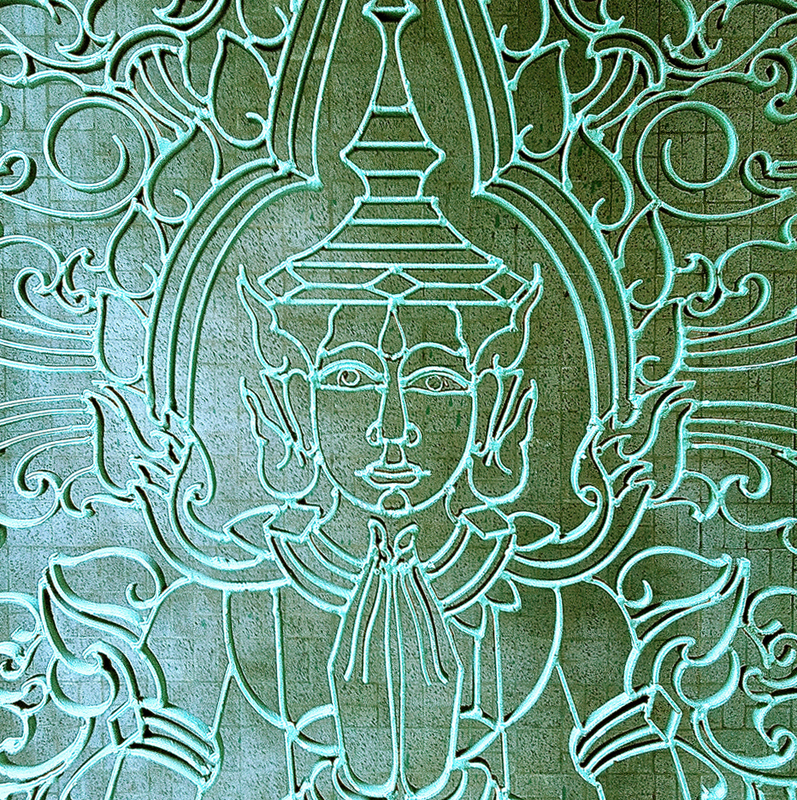 The ceiling of the Throne Hall is painted with depictions of the Reamker story, a tale deeply embedded into Khmer culture. As I read about the story, I recognized elements of it from my favorite childhood movie, A Little Princess. Anyone else feel a mix of thrill-nostalgia when you watch this clip? The calm I felt in the Throne Room continued through the gardens. 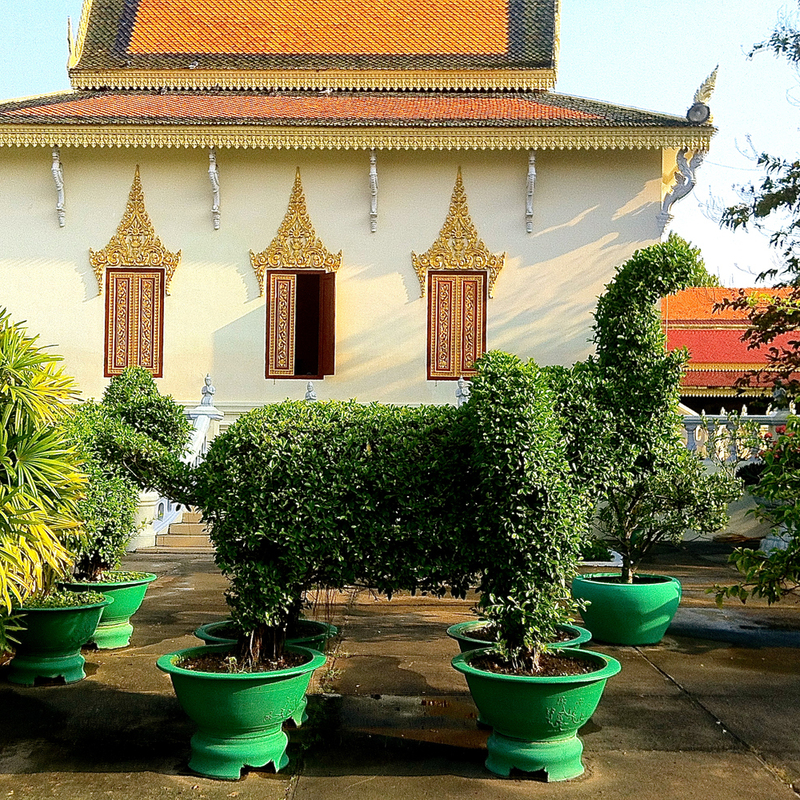 Check out this elephant topiary! 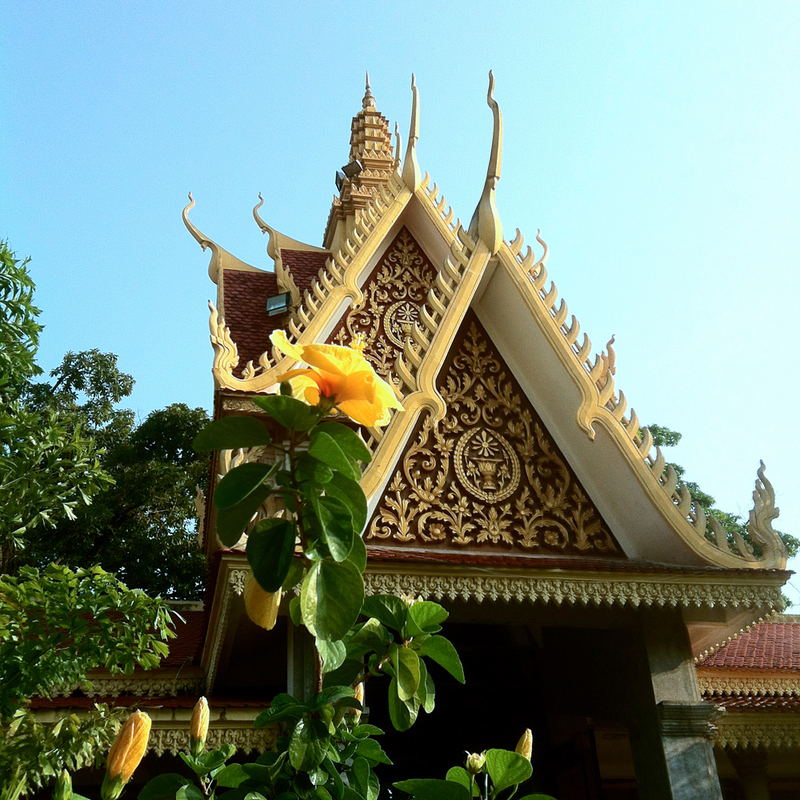 My other favorite room was tucked near the Silver Pagoda. Other people were walking by it, but Heidi and I slipped off our sandals and walked in. As soon as I entered, I felt yet another layer of calm, almost like I wanted to sleep. There’s a large box filling most of the small room, and on the other side from where we entered, a line of meditative figures adorn a raised Buddha. On one side, the figures have hands in prayer position, and on the other side the figures are sleeping, perhaps representing the day Buddha transitioned into Nirvana through death. I just stood there for a few moments, soaking in the utter peace of it all. 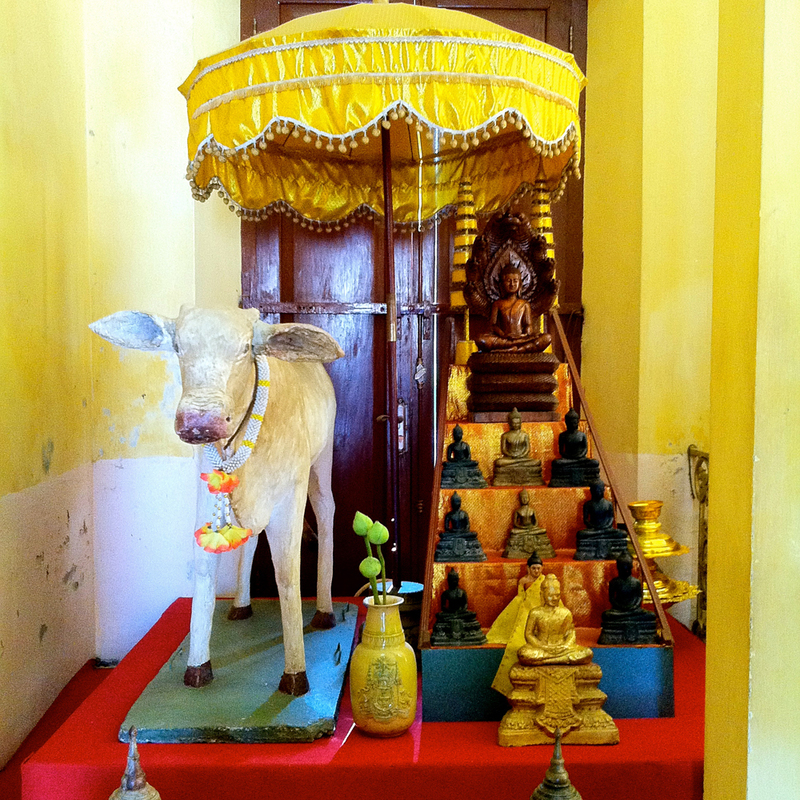 When I walked around to the other side, I discovered the sweetest shrine with a cow! I’m not clear on the symbolism of the cow, but two students told me the Palace has a cow who predicts the harvest season each year. One day each year, the cow is brought to a table with wine, grass, rice and corn. If the cow consumes the wine, the crops will not grow. If the cow consumes the grass, the crops will be diseased. If the cow consumes the rice or corn, that crop will have a healthy harvest season. Walking out, I saw a sign explaining the large box. It holds the footprints of the original four Buddhas, or footprints that represent the Buddha’s first four steps. (I didn’t completely understand…) Either way, the peace in this room was palpable. 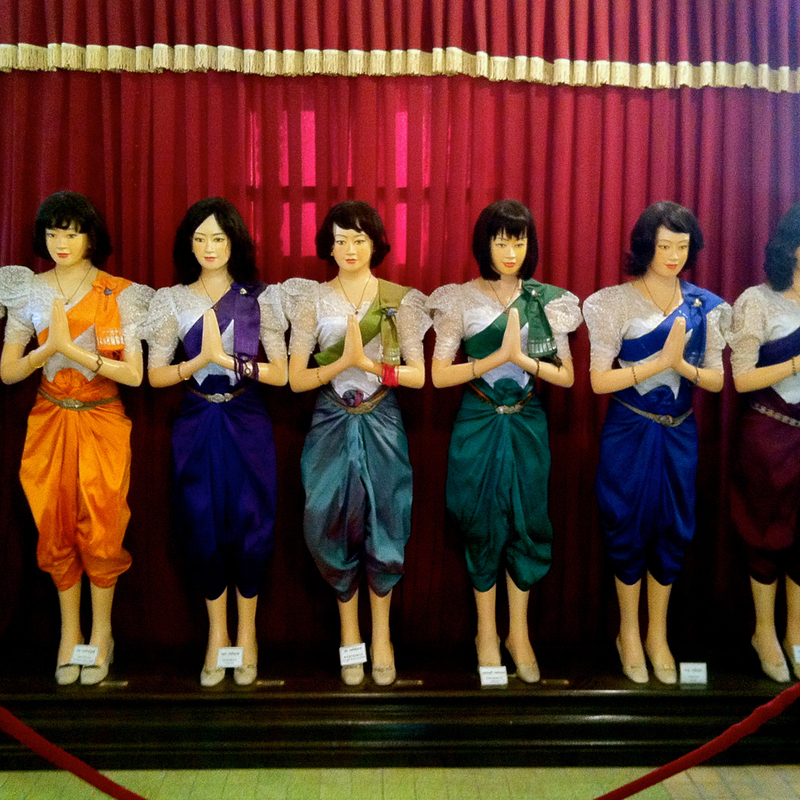 In a room with cherished relics called Wat Preah Keo Morokat, another that we weren’t allowed to photograph, I found myself walking behind a family with a young girl, her mother, and an older woman who appeared to be the child’s grandmother. They walked very slowly and carefully around the edges of the room, observing the small relics with care. I started to walk around them, but felt a strong tug on my arm. The older woman was pulling me back to my place with a smile. I looked around and saw three monks coming in the door in a line. 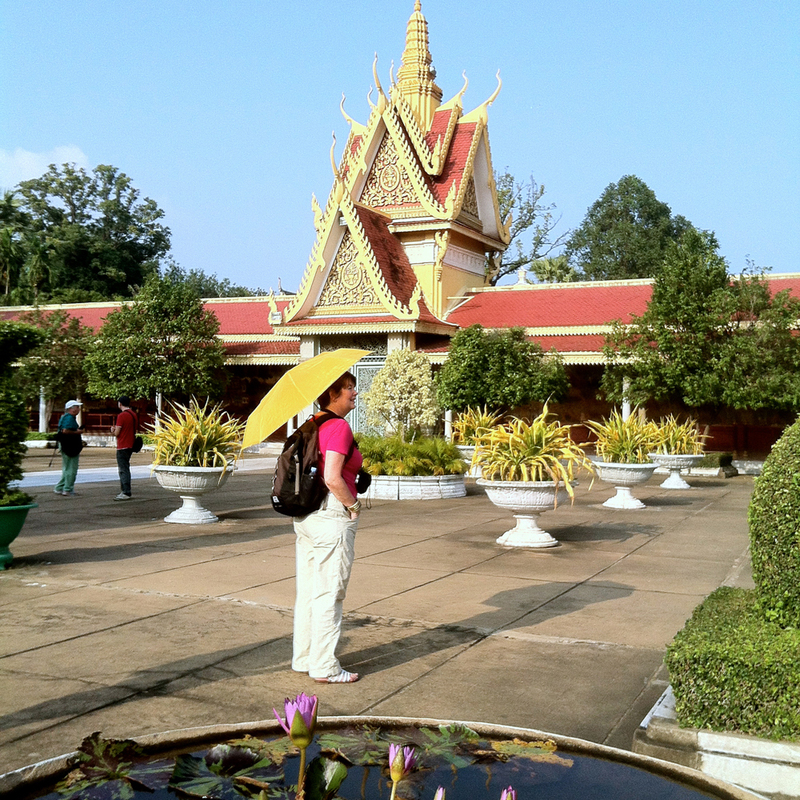 I realized she was making sure I didn’t walk in front of the monks. I bowed and thanked her for reminding me how to be respectful in this most revered of places. She very sweetly and happily smiled and bowed back. It was a strange and lovely moment of connection. 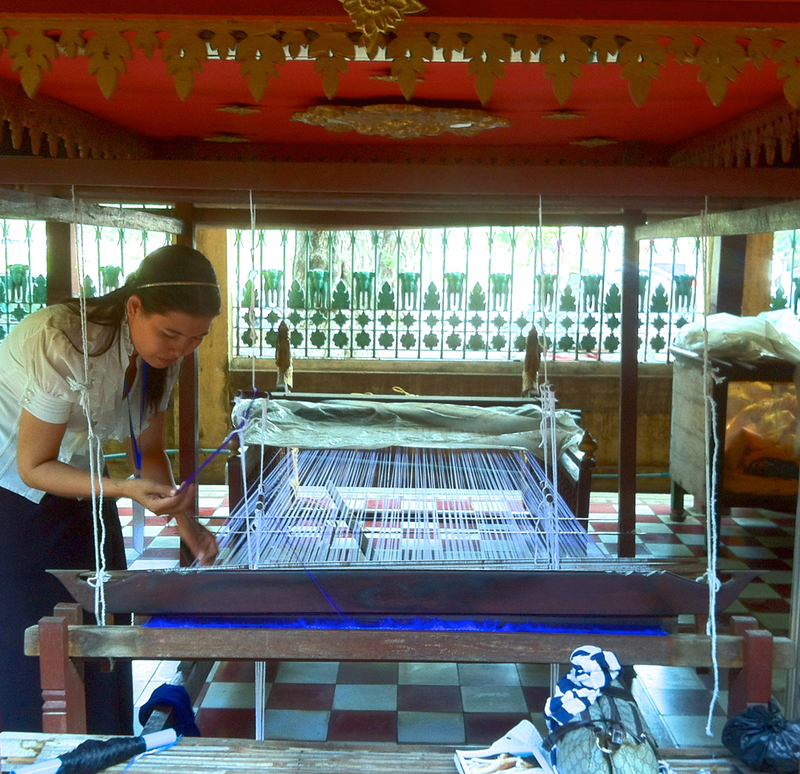 On our way out of the palace, we snuck past a large tree away from the crowd again and saw a lovely row of looms with artisans weaving silk. Gorgeous! 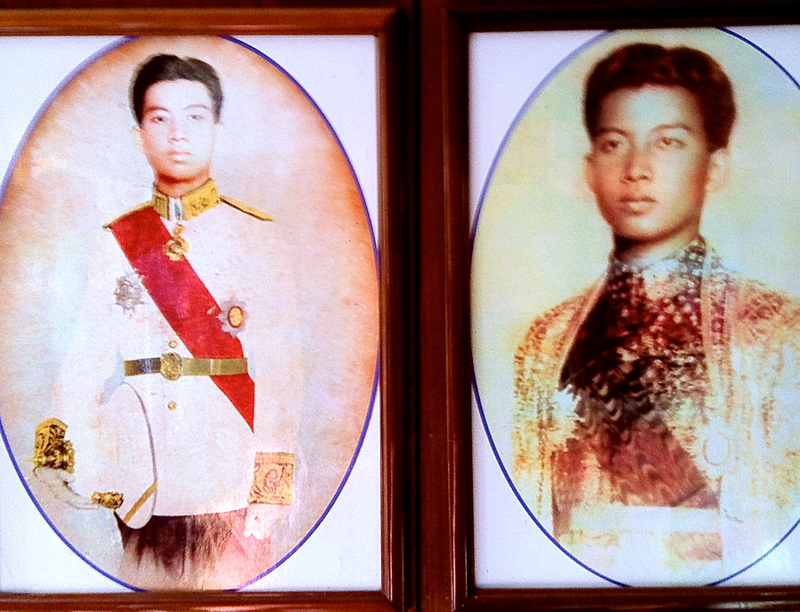 Before exiting the palace, we walked through a room with photos of the current King, as well as his father. 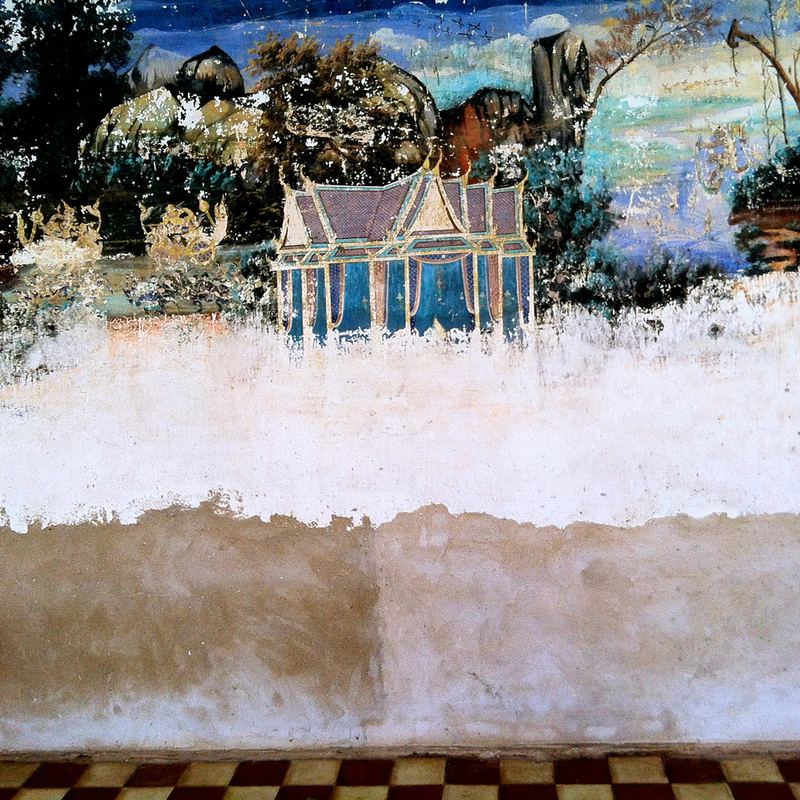 I caught a young woman gently touch the face on the photo to the right below, a reminder to me of how beloved the Khmer King is. The last photo I snapped was of the iron gate leaving the grounds to go back to the busy street. How lovely! I wish I could come with you to see it. And I absolutely adored the clip from the Little Princess…I’m certain I would have felt the same way. I probably couldn’t have helped singing Kindle My Heart under my breath if I had been there. We never did watch a double feature of A Little Princess and The Secret Garden, did we? Anyways, I would have loved to feel the calm and peace you describe. I don’t think I’ve felt that way since a long ago Quaker meeting. I need to go back. I need to Ohm too. P.S. 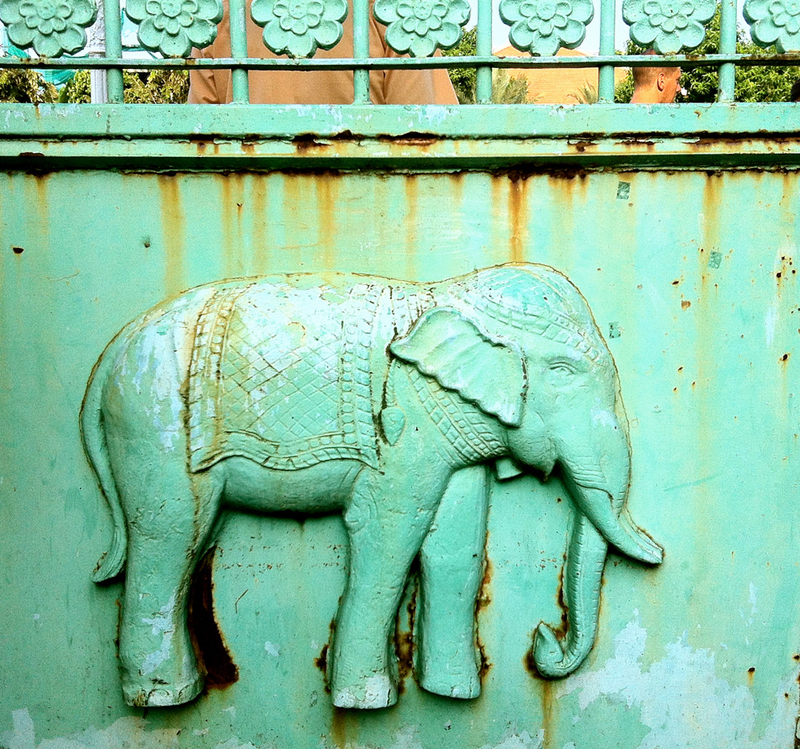 I love the last picture of the Elephant on the gate. Gorgeous! Oh Courtney, what I wouldn’t give to watch a marathon of these movies with you! Please, please can we travel together soon?? Thank you very much for mentioning my blog. 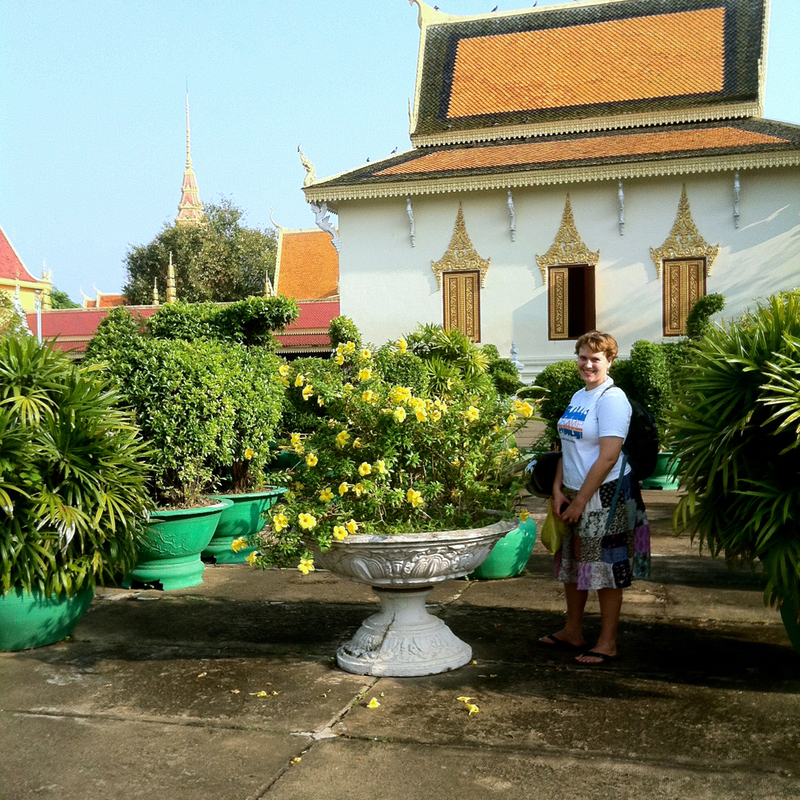 I loved my time in Cambodia! Gorgeous country! 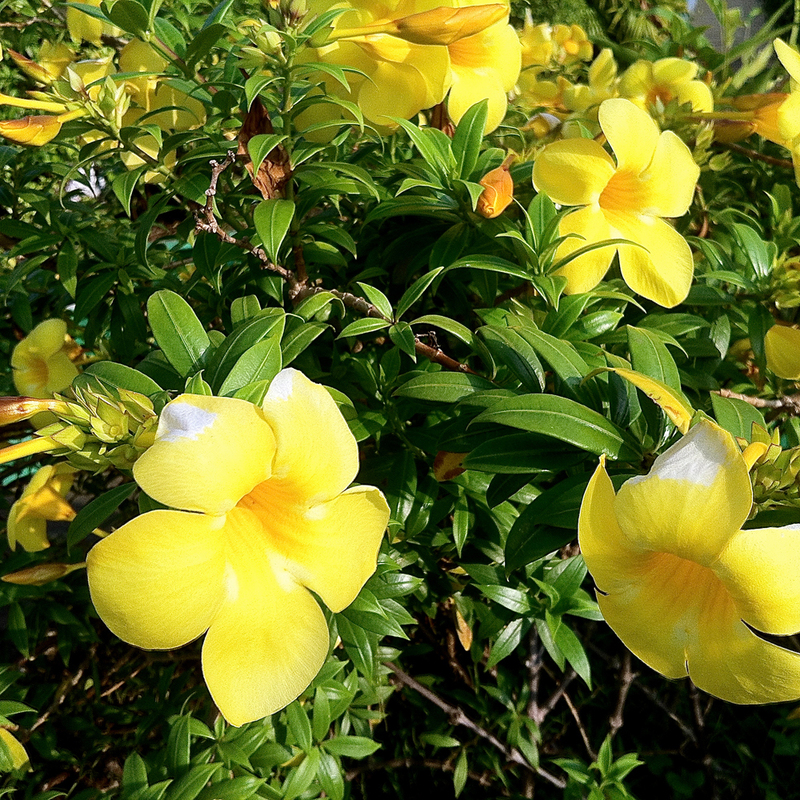 You have a beautiful blog! And Cambodia really is a special place.